Editor's Note: Technobabble is our occasional series looking at the more colorful sides of technology, including research-based musings that illustrate the CIO Dive Editorial Team's case for the future HQ2 location. Last week, Amazon unveiled its list of 20 HQ2 finalists, forcing 218 companies into a lonely hearts club and ensuring multiple municipal identity crises. Just ask Charlotte, NC, which was left with the lingering question: "What's wrong with our city?" Well Charlotte, it's not you, it's the market. You can't blame your wholesome city for not being on the forefront of tech innovation and without proximity to major metropolitan corridors. What Amazon really wants is access. Access to other corporations, access to ports, access to leading colleges and universities and access to a thriving urban area that allows it to attract talent in an outrageously competitive market. Amazon is asking for nothing short of perfection and some cities just didn't make the cut. Are the finalists perfect? No, but they'll do everything in their power to offer perks to nab Amazon's final rose. When HQ2 mania began, CIO Dive offered its choice of three likely contenders. Two of the cities we presented made the final round (sorry Detroit), so we're going to call that a win. With the field narrowed significantly, it is time to offer CIO Dive's assessment. Narrowed into three categories which we consider — highly likely, a hard maybe and never gonna happen — are CIO Dive's take on which cities have a fighting chance and why. Is it subjective? Absolutely, but our conclusions are based on geography, metropolitan area, tech workforce access and pure journalistic instinct. By Naomi Eide, who has lived in Maryland, Virginia and D.C. and considers herself an expert on the area. While it praised "enthusiasm and creativity" in its proposal, Amazon was really seeking insight into what makes North American communities tick. Though the company said it would consider options anywhere in the U.S., HQ2 is really about creating something Amazon doesn't already have. So what doesn't Amazon have? Access. Amazon does not have an East Coast headquarters, which could tap into major cities on the highway 95 corridor and offer quick access to government stakeholders and the scores of universities dotting the eastern seaboard. Many have seen Boston as a safe bet, particularly after reports surfaced that Amazon was looking into 1 million square feet of office space in Boston. The Massachusetts Institute of Technology is also close by, allowing for easy collaboration between cutting-edge research scientists and facilities. Scores of young companies populate the area, something that Amazon just capitalized on with the acquisition of cybersecurity startup Sqrrl. However, four of the finalists strike an interesting chord: the greater Washington metropolitan area locations and Raleigh offer close proximity to the backbone of the internet and other infrastructure-oriented companies. Raleigh maintains Research Triangle Park, the largest research park in the U.S., which is the home to more than 250 companies, including tech giants like Cisco and open source maven Red Hat. Many RTP companies focus on work that runs technology for modern businesses, which is part of Amazon's core portfolio. 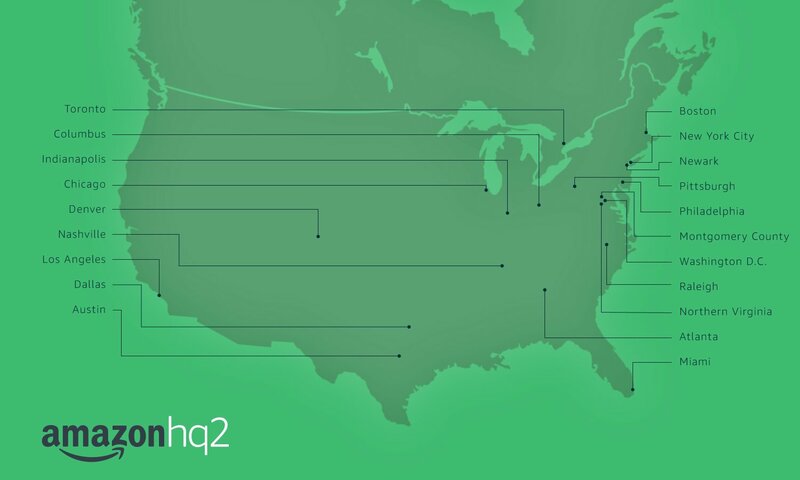 HQ2 has the possibility of serving as not only a second headquarters, but a center for Amazon's most lucrative business: Amazon Web Services. The greater Washington metro area is at an advantage, with three of the finalist slots. The only other finalists with such close proximity are Newark, New Jersey and New York City, but the crushing population density puts that area at a disadvantage. The Washington region, however, offers a diplomatic entry point with proximity to the world's heads of state in town for other, more political reasons; access to three airports; close proximity to the very core of the internet and "Data Center Alley," which runs through northern Virginia; and access to "Cyber Corridor," which has emerged in Arlington, VA, thanks to a concentration of former military and government employees with security clearances. Consider, too, Toronto, Amazon's only international option. As we highlighted in our last projection, Toronto provides Amazon a workaround during a time when it is increasingly difficult to acquire talent from other countries. The city is also becoming a tech hub, with major players investing in municipal initiatives, such as Alphabet's Sidewalk labs. By Alex Hickey, who has lived a significant portion of her life outside the U.S.
We made a case for Austin, TX back in November. The city was ranked the No. 1 choice for Amazon by Moody's, it has a strong labor and tech workforce and it scores high on transportation, geographic location and access, cost, quality of life and business environments. And after all, everything's bigger in Texas. Nashville may be a state capital, well located and replete with educated workers, but Music City will probably remain home to just one kind of Titan (that's a sports joke for my fellow nerds). This may be a better deal for everyone, because if the Amazonians descend, destination bridal showers are going to need to find a new home and visitors can kiss affordable Grand Ole Opry tickets goodbye. When looking at the map of HQ2 contenders, Denver and Los Angeles almost look like misplaced dots, falling far, far west of every other contender. Though Denver has plenty of tech talent, a thriving startup scene and a lower cost of living than most other contenders — and not to mention it was selected as The New York Times' winning HQ2 bidder — it is, ultimately, too close to the West Coast and too far away from the other half of the country. Ol' Blue Eyes may have wanted to be a part of it, but does Jeff Bezos? The Big Apple and nearby Newark, NJ are hubs of well, everything. It's probably easier to make a list of things that area doesn't have than what it does. But that may be the inherent problem. Costs are high, space is low and a dense population is straining everything, from transportation to tempers. Pittsburgh is a blossoming tech hub and smart city. The details of its bid, however, are unknown — but just for a short while longer. On Thursday, the Pennsylvania Office of Open Records ordered the city to release bid details within 30 days. By Samantha Ann Schwartz, who last lived in a state (Florida) sure to scoot into the ocean. Amazon could have the opportunity to cozy up next to Comcast NBCUniversal in Philadelphia. But alas, it is unlikely Amazon has much brotherly love to spare for the city. Despite being the perfect location, between New York City and Washington, D.C., it doesn't reflect the liberal societal architecture that tech giants tend to be drawn toward and its school funding crisis may also be a deterrent. And maybe Amazon simply does not have chutzpah to handle Eagles fans. I spent some of my childhood summers in Ohio avoiding Daddy Long Leg spiders so I only have fond memories of the state. Columbus, Ohio embodies midwest modesty and wholesome America. Columbus offered the tech giant a 15-year, 100% property-tax abatement with access to Buckeye elites. However, metro city dwellers need access to traditional metro amenities — something Columbus lacks. While Los Angeles seems like the perfect place for another west coast tech hub and Bezos's biceps, it isn't suitable for HQ2. Though it does have Hollywood ties and its access to ports and warehouses make somewhat viable, LA is keeping its purse strings tight when it comes to offering tax credits, reports the LA Times. Finally, Miami is projected to be underwater by 2100, so why waste the infrastructure? Unless submarines become available on Prime.